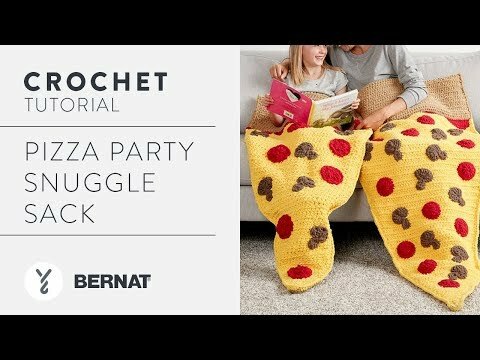 Put your favourite toppings on this cheesy-to-make pizza snuggle sack, stitched in Bernat Blanket and Bernat Blanket Brights yarns. Adult Version: Approx 75" [190 cm] long x 84" [213 cm] circumference. Kids Version: Approx 50" [127 cm] long x 55" [139.5 cm] circumference. Mom and child can both enjoy this whimsical sack, designed for sharing on chilly nights. Bernat Blanket is a soft and cozy, chenille-style yarn that’s super bulky, so you know you'll stay warm. Plus, choose from a variety of shades to spark your imagination and delight those little faces. Cuddle-up!